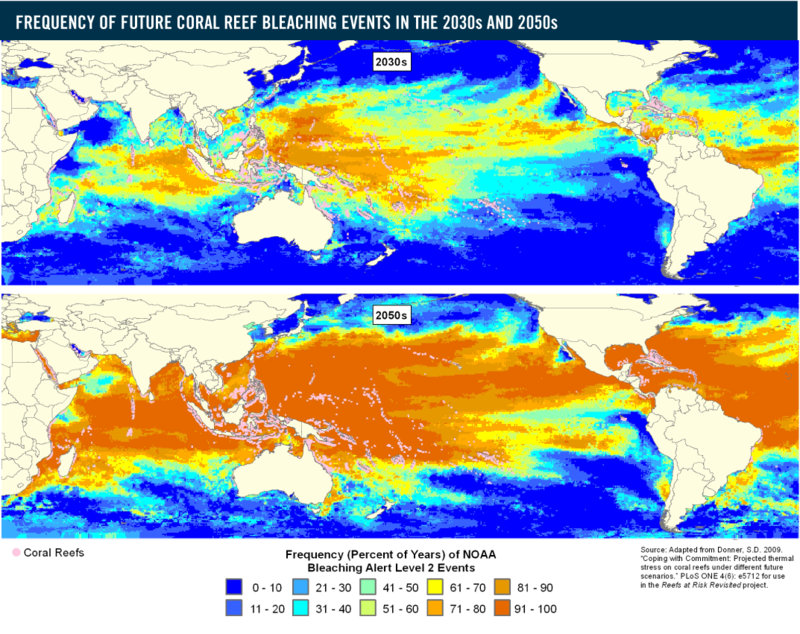 The map depicts the frequency of future bleaching events in the 2030s and 2050s, as represented by the percentage of years in each decade where a NOAA Bleaching Alert Level 2 (i.e., severe thermal stress) is predicted to occur. Predictions are based on an IPCC A1B (business-as-usual) emissions scenario and adjusted to account for historical temperature variability, but not adjusted by any other resistance or resilience factors. Data were adapted from Donner, S.D. 2009. “Coping with Commitment: Projected thermal stress on coral reefs under different future scenarios.” PLoS ONE 4(6): e5712 for use in the Reefs at Risk Revisited project. Have You Heard of Coral Bleaching?